I wasn't going to post this for about a week, because I still have a bunch of swatch photos where my nails are longer before I broke quite a few of them, but this was one mani that I just had to share! 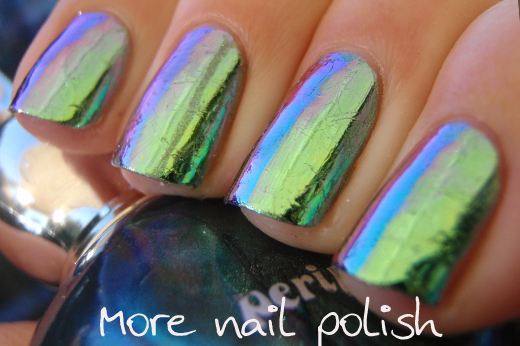 Continuing with my renewed love of nail art foils. Remember how I said I bought a whole new collection of nail art foils off ebay, well this is one of them. 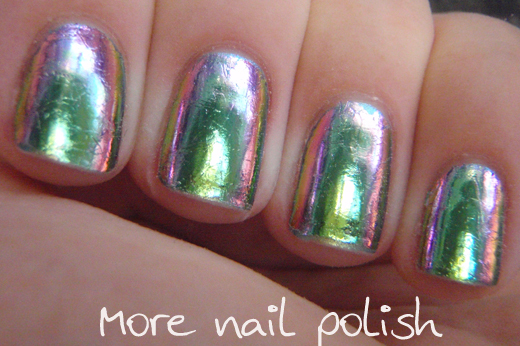 I bought my nail foils from an Aussie seller (cause I wanted them quickly and didn't want to wait for postage). I can't see this foil listed individually on her listings, I bought mine in a set of 20 foils where I chose the 20 I wanted. This was #45. 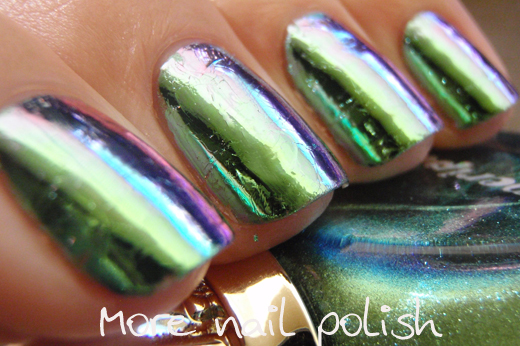 This foil is the only duochrome nail foil I've ever seen. The base colour is a metallic green (think the base colour of China Glaze Unpredictable/Missha HGR001/Peripera Metallic Green). 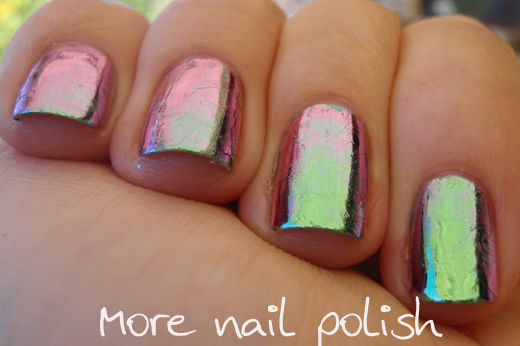 The colour shift on this foil is to a pink and purple shade (which is different to the above listed polishes which shift to teal blue). 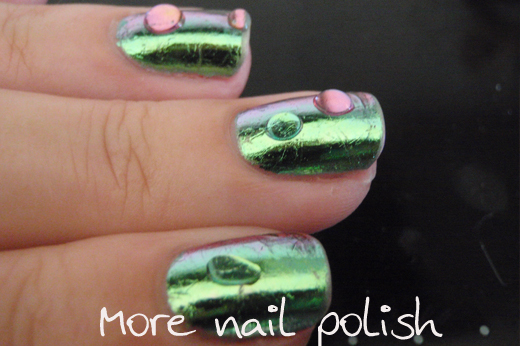 I did a base of Peripera Metallic Green in case there were any gaps in my foils, then applied the nail foil glue and let that dry completely. I then put the foils on and covered them with two coats of Picture Polish Revolution to protect them. These next three photos were taken on day three of wearing this mani, so there is most definitely tip wear showing here, but I thought it demonstrated very well how good Picture Polish Revolution is at protecting the foils, whilst keeping them wrinkle free. When I was in the shower, I noticed how pretty droplets of water looked on my nails, so I took some photos of gently placed drops to show you. The last two photos are taken underwater. 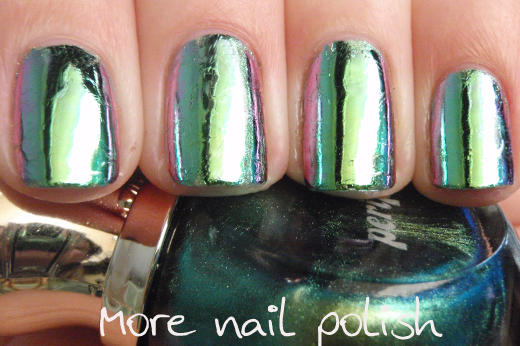 Underwater shots make duochromes look amazing - even this mani on day three! I hope you guys like looking at nail foils, because I'm still completely obsessed with them. 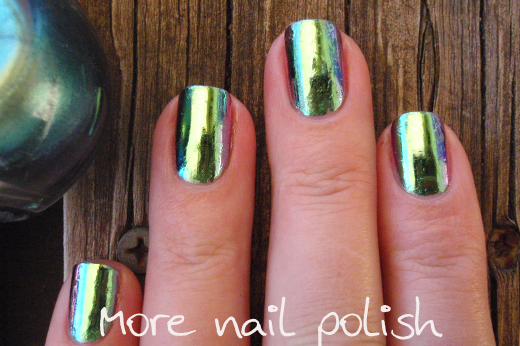 I love me some shiney blingy nails, and they don't get shinier or blingier than nail foils! That looks amazing! Especially the last two photos. Who would have thought that one day there will be underwater swatches? Greatly creative and thanks for sharing! I also love the look of water droplets, I often wish there were decals/rhinestones that are clear throughout (no opaque backing) to imitate that look. OH yes, I know exactly what you mean. Like little miniture clear cabochons that you can put on your nails. I must go search online to see if I can find anything. Maybe scrapbooking supplies would have them. I've never tried using foils, but, now, i'm in love for them! Oh these look fabulous, especially underwater! 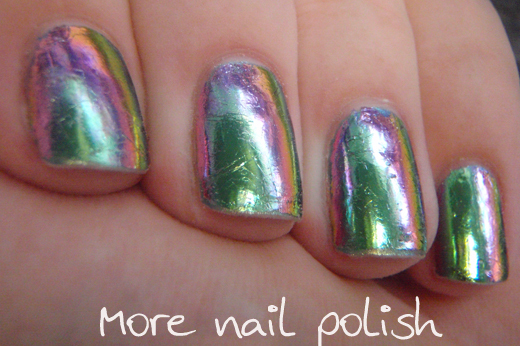 Have you tried the peel off base coat as foil glue? I'm curious if that works, after all, the peel off base is somekind of glue. Yes, I've tried PVA glue as the base for foils and it didnt work. It dried smooth and not sticky so the foil didnt stick.